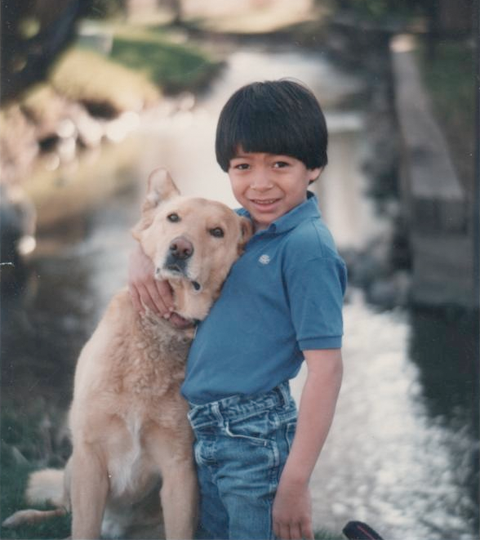 Tom with his dog “Mike” when Tom as about 7 years old. Carlos Thomas Whitaker was born approximately the middle of September of 1978, but the known details of his birth are sketchy. His birth name was Carlos Godines Ponce. It was believed he was born in Hospital Materno in Tegucigalpa, Honduras, and later found as a toddler, abandoned in a motel room. Severely malnourished, he spent the next two years in three different hospitals before he was healthy enough to be sent to an orphanage. After Bonnie adopted him, and brought him to the U.S., his physical exam told the story of him coming from very humble circumstances: no access to soap or proper hygiene, a distended stomach full of parasites, and a birth mother who was malnourished as she carried him during her pregnancy. 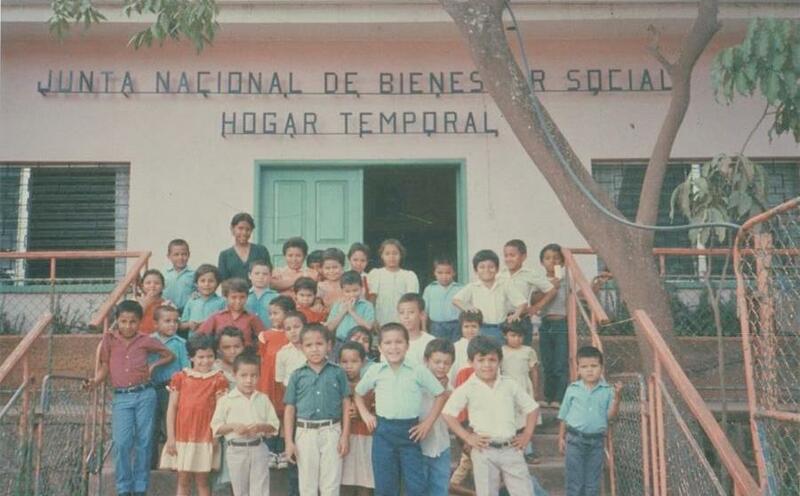 In 1982, After many years of prayers and a mountain of paper work, Bonnie found herself thousands of miles away from Utah in an orphanage in Honduras called, Hogar Temporale. Tom and Bonnie first connected, literally, with Tom’s fingers grasping on to her back like little suction cups as the Honduran worker told Carlos that this was his new mother. She tried to keep the tears in check so Tom wouldn’t become alarmed, but they came anyway. Sheets of them. The years of waiting and hoping for a child were over. Bonnie was totally exhilarated, and as euphoric as if she had just given birth to him. The following day, Bonnie got custody of Tom. They had arranged to live in the home of a woman named Dona Christina while we spent the next two months to completing paper work. The first night back at our room, Tom tried on every article of second-hand clothing that she had brought for him. He was thrilled. Bonnie then put him in some footed pajamas, we played for a while, and then she put him in bed. He stayed in bed for about 5 minutes and then decided the game was over. He then got up and began putting on his thin, threadbare clothes from the orphanage, thinking she would be taking him back. He didn’t realize that he was staying for good. And we had no common language for me to communicate to him what was happening. Miraculously, though, Tom slept through that first night, and in the morning she woke to find him standing over her, breathing down on her, with a big grin on his face. It was about 6:00 in the morning, and the race that was to be her new life with Tom was on. They spent the next 3 months in Honduras going to doctors, meeting with attorneys, and visiting court. In between their business, they spent time visiting the marketplace, buying a few simple toys, and drinking the cold lemonade from plastic bags sold in the markets. They quickly got to know one another, and for her it was a baptism by fire into motherhood. He acted like he didn’t know what the word “no” meant, even though it happens to be the same in both English and Spanish. This character defect plagued him the rest of his life. Stubborn, extremely active, curious and full of mischief all describe Tom’s personality. And of course, to her, totally lovable. Tom’s grade school years were a challenge. Because of his early difficult years, he had anger issues. Large groups of children were always a threat to him, and he tended to be more aggressive in their presence. On the other hand, he always seemed to make friends easily and was loyal and non-judgmental. He was a great mimic and lived to entertain and make people laugh. He was pretty successful at it. As Bonnie recalls, from the 7th grade on, though, Tom was on a downward spiral. He really got lost in the shuffle of junior high madness. He struggled from then on, hanging out with the wrong crowd, drinking, staying away from home. Lots of bonding issues began to appear. At night she'd lay awake in fear waiting for a call from the morgue, or the police. Somehow, through it all, they kept our relationship in tact. She believes he knew that he was loved, but he had missed out on those early formative years and was impossible for her to control. Bonnie learned from this experience how crucial early nutrition, bonding, and family stability are to a child’s development, and their entire future. Bonnie poured every ounce of physical, emotional, and family resources available into helping Tom overcome these early disadvantages, but it just wasn’t enough. After the tragedy of September 11, the federal government clamped down on U.S. residents who were not citizens, and began deporting repeat legal offenders at a high rate. When Tom was 24 years old, Bonnie learned she had done some of his adoption papers incorrectly, and he was never actually made a citizen. Because of Tom’s actions, he, along with many other adopted children were being deported back to their home countries. Tom was among them. He knew no one in Honduras, and could not speak the language. True to form, though, Tom’s charm, charisma, and scrappiness (probably learned in the orphanage) enabled him to make the best of a bad situation, just as he had managed to survive as a young boy. He was able to quickly endear himself to many of the new friends he made in Honduras. He was 25 years old and starting life all over again. Again. This time on his own. Bonnie found out when she visited him the following Christmas that everyone knew Tom, and called him “The Gringo” affectionately. Five years later, on December 4, 2010 Bonnie got the call she had been dreading all these years. In broad daylight, Tom was shot and killed right in his own neighborhood in Tegucigalpa. According to witnesses, two guys in a pickup truck had driven up to Tom and a friend and pointed a gun at his friend. Tom tried to knock the gun out of the assailant’s hand but, the bullet strayed and it hit Tom instead of the intended target. My emotions ran a gamut from intense grief to a sense of relief that he had escaped a very difficult life. Bonnie could see that things weren’t going to improve for him in Honduras because of alcoholism, which she felt was going to plague him for the rest of his life. Even though she would miss him terribly, Bonnie felt some solace in knowing that he was liberated from the pain of his life, that he was home and free at last. Tom at the orphanage. He’s in the lower far right. 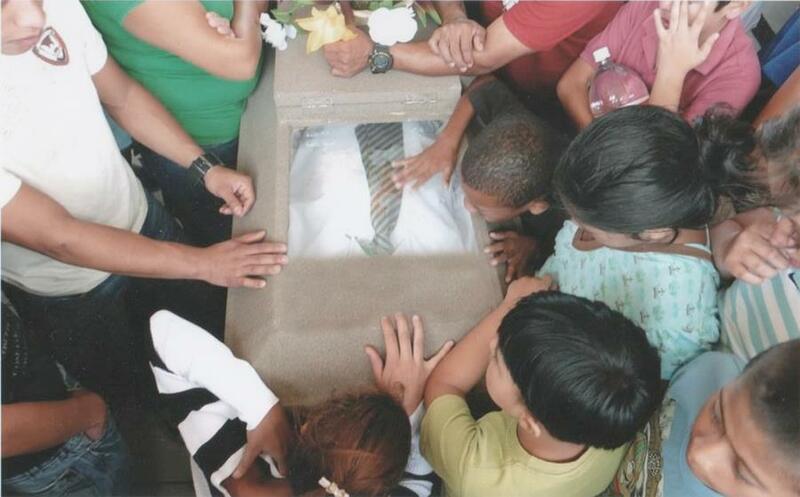 Tom’s funeral service in Honduras at the age of 31. He was beloved by all the children.